Halloween decorations made by The Beistle Company are some of the most popular collectibles among fans of vintage holiday decorations. Specializing in paper party supplies such as die-cuts, centerpieces and paper plates and cups, The Beistle Company has been manufacturing Halloween novelty d�cor and supplies since the beginning of the 20th century. Founded in Pennsylvania by Martin Beistle, The Beistle Company is still in business today and is one of the largest manufacturers of Halloween goods in the US. But for collectors, it isn't Beistle's new products that cause the most interest. 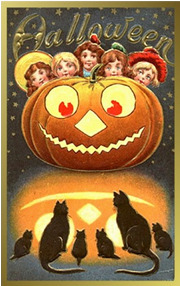 It's their highly sought after vintage Halloween decorations that have become highly collectible. Some of the vintage Beistle decorations you should be on the look-out for if you are seeking to start or add to your collection are Halloween die-cuts, lanterns and other paper products for the table. Many of the Beistle decorations feature honeycomb tissue paper so you can find items like Jack O'Lanterns with arms and legs that bounce, but due to the fragile nature of the honeycomb tissue you will want to inspect any purchases carefully and also make sure you carefully store any paper products that you buy when they aren't in use. 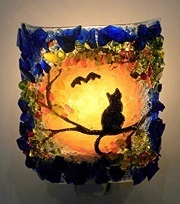 One thing to be aware of if you looking for Beistle Halloween decorations to add to your collection is the fact that some of their most popular vintage designs have been reproduced recently so you should be wary of unscrupulous sellers who are claiming the repro items as the original vintage products. All of the reproductions are marked with the year of production and the paper they are made out of is heavier than the paper Beistle used in the 1930s and 40s so if you are shopping in person it will be easy to spot the difference. But if, like most collectors, you are putting together your Halloween collection with online purchases and Ebay auctions, the best advice is to stick to well-known and reputable dealers who have a reputation to maintain and lots of positive feedback on their auctions. Beistle has used various trademarks over the years and there are several to keep an eye out for when you are determining authenticity. Depending on what kind of product you are looking at, the trademarks will either be stamped, printed, labeled or embossed. The most common trademarks include: "H.E. Luhrs"; "The Beistle Company" printed signature, "Bee-Line" which may or may not include an image of a bee in flight; and the Beistle Diamond Trademark. On their tissue products you may find the "Art Tissue Westminster Bells" trademark. Some of the most interesting of the vintage Beistle Halloween decorations available were made between the years 1900 and the early 1950s. Due to the fact that Halloween was much more of an adult oriented holiday than it is today, you'll often find that early decorations had more of a spooky aspect than the stuff made for children's Halloween parties and trick or treat outings today. So as you build your collection, it may make the most sense to stick to products manufactured in the early half of the century in order to maintain a consistent feel to your Halloween collection. 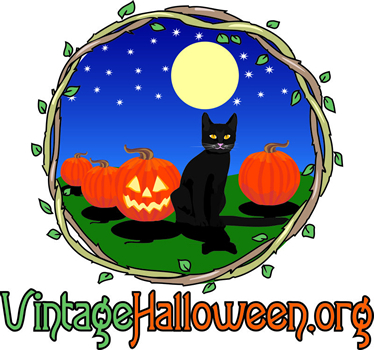 You can find many great examples of vintage Beistle Halloween decorations, such as the wonderful vintage Halloween die-cuts made by Beistle. And don't forget vintage Christmas lights.